Phyre has a haunting past. The girl without a last name and fire in her hands burns with a history of destruction to save herself. Solace is finally found in the cozy comfort of Hestia’s Home, a place for women who need hiding. Just like her five surrogate sisters-in-solitude, Phyre yearns to extinguish memories and rekindle her spirit. Her plan blazes forward until he arrives. Hephaestus Cronus considers himself an ugly man. A near-death accident left him disabled but not without heart. His gratitude lies with the protection of his foster mother, Hestia. 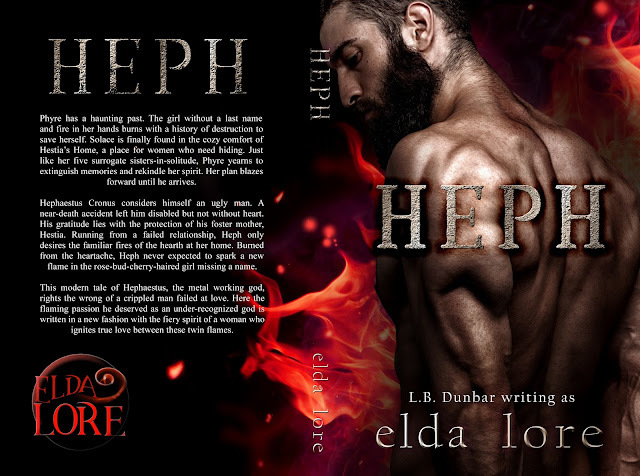 Running from a failed relationship, Heph only desires the familiar fires of the hearth at her home. Burned from the heartache, Heph never expected to spark a new flame in the rose-bud-cherry-haired girl missing a name. This modern tale of Hephaestus, the metal working god, rights the wrong of a crippled man failed at love. Here the flaming passion he deserved as an under-recognized god is written in a new fashion with the fiery spirit of a woman who ignites true love between these twin flames.